Ramblings: “All In” at Palmetto Bluff’s Music to Your Mouth. Hugh Acheson’s (Empire State South in Atlanta) roasted Caw Caw pork belly with woodland fermented carrot and radish, kimchi, sorghum soy lime vinaigrette and “Anson” benne. Caw Caw is an ‘artisan’ pork producer in St. Matthews, SC. Fall is an awesome time of the year to be in Bluffton, South Carolina! 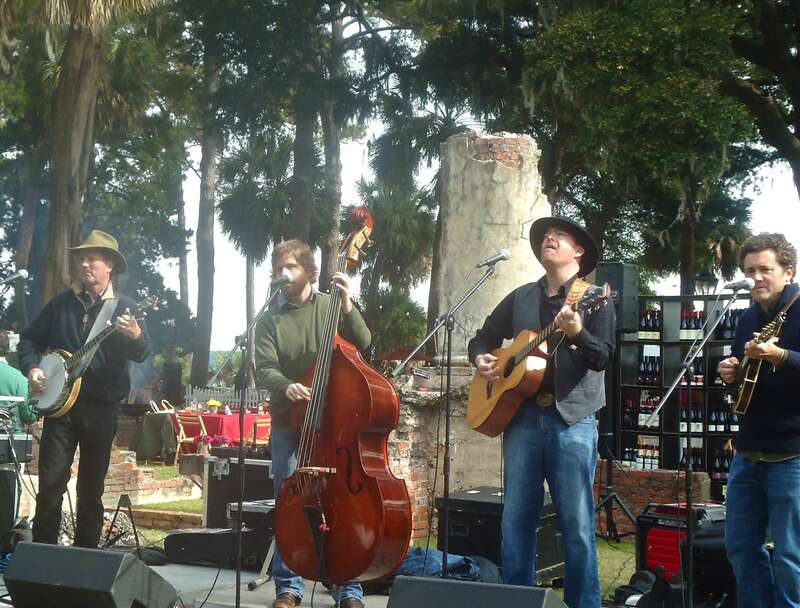 Not only is it the season for oyster roasts and all manner of outdoor activities, when the calendar rolls over to November then it’s time to gear up for Music to Your Mouth (MTYM) at Palmetto Bluff. Attending the Culinary Festival during this week-long event is an honest-to-goodness gift of the highest order, if you are, like me, a foodie. 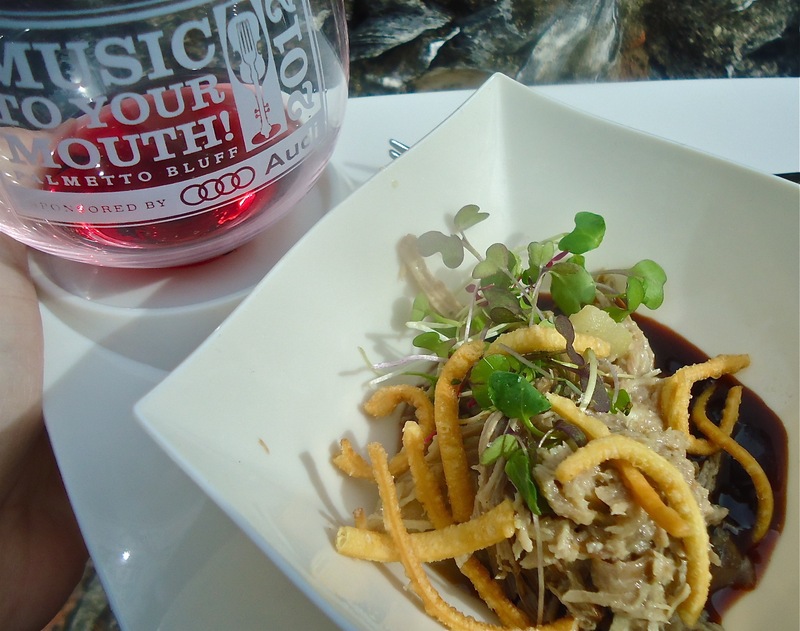 Music to Your Mouth is now in it’s seventh year of laser-focusing attention on all things delicious and Southern set against the wild, beguiling beauty of Bluffton’s May River and environs. And being the good neighbors they are, MTYM dedicates a portion of ticket sales to local non-profit Second Helpings, who distributes food destined for landfill to the disadvantaged in Beaufort, Jasper and Hampton Counties in South Carolina. During the week leading up to the crescendo of the Culinary Festival (and afterwards too) there are food-centric events like a “foraging cruise” nearby Daufuskie Island, a cooking class with James Beard award-winner Chris Hastings and a floating cocktail party aboard the resort’s circa 1913 yacht, dubbed the “Stink & Drink”. I love that name! Add in the annual Potlikker Block Party and the Kiss the Pig Oyster Roast and you’ll find that the “best sips, swills, sweets and savories in the south” and the most “talented local and regional chefs and artisans” are to be found at MTYM. The bacon “forest” complete with sweet and savory porkalicious offerings. 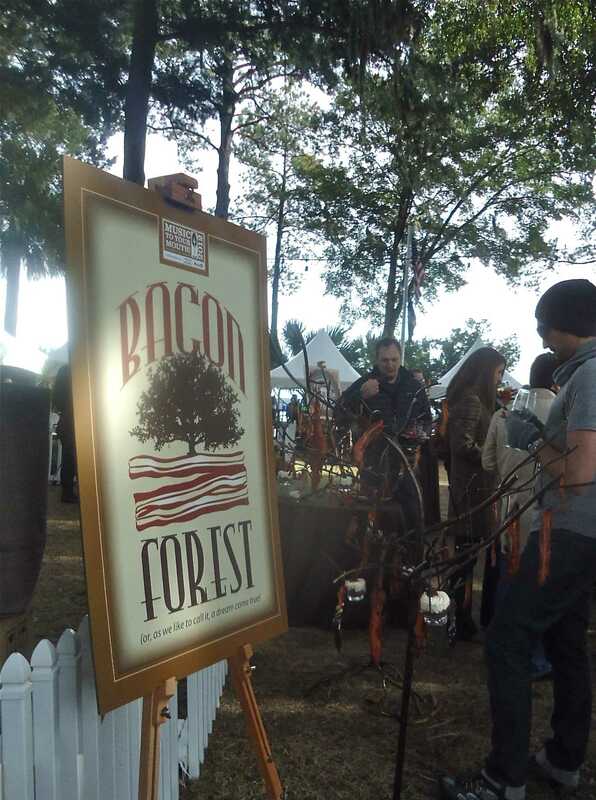 Not only that, but this year there was even a “bacon forest” – I am not joking people! The Culinary Festival also included a veritable king’s cellar of fine wines and spirits for the sampling and cooking demonstrations by the likes of celebrity chefs Kevin Gillespie, Mike Lata, Sean Brock, Hugh Acheson and Ashley Christensen. Southern Foodways Alliance director and all-around Southern food enthusiast, John T. Edge, hosted all proceedings for the day. Even with all the regional chef-celebrité under the tent it was exciting to see local favorites Orchid Paulmeier (One Hot Mama’s), Ted Huffman (Bluffton BBQ) and Matt Jording (Sage Room) bring on the creativity. Ted’s creamy, smoky pork barbeque with traditional crunchy slaw started my culinary tour off right! Orchid kicked it up with her “Lowcountry sushi” and Chef Jording’s duck with microgreens and crisp sesame noodles was perfection on a plate. Chef Chris Hastings and his wife, Idie, hard at work under the big tent. In the two years I lived in Birmingham I could not make it to his restaurant, Hot & Hot Fish Club (dang it! ), but I do have his cookbook, which is excellent by the way! Other favorites were Chris Hastings lamb with quinoa and Craig Diehl’s paté wrapped in pastry. 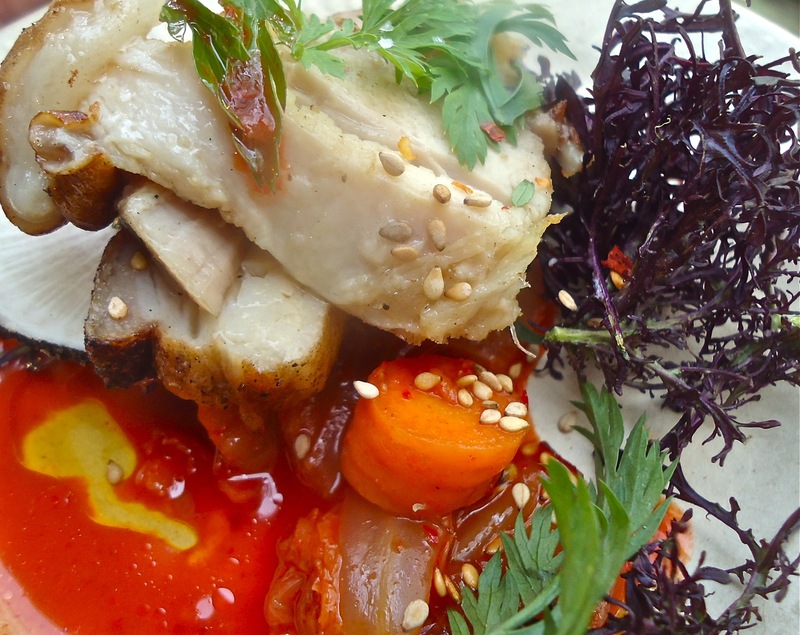 I am not exaggerating when I state that everything I tasted was over-the-top fantastic. 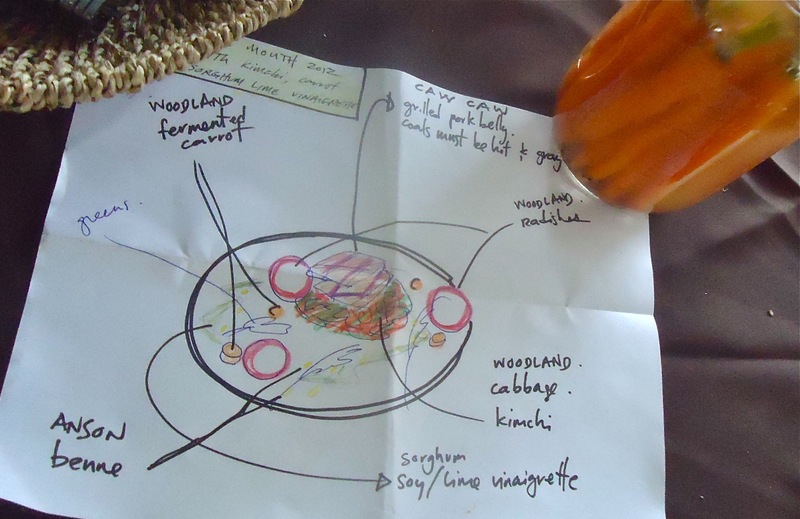 However, I will go out on a limb or rather a palm frond, and pin my top taste “award” of the day on Chef Sean Brock (Husk & McGrady’s restaurants in Charleston, SC) and his ‘apple salad’. At first glance this plate deceivingly presents a few crisp apple slices with what appears to be black sawdust on top. Huh? Just dig in with a fork… and surprise! There’s local lump crabmeat nestled underneath the black butter (not saw dust!) and thin apple slices, lightly drizzled with delicious hazelnut oil and circled with a trace of bright green tarragon puree. Managing to get a bit of it all in one bite, it was in two words: extraordinary and sublime, all at once. Chef Brock, you did it, again. If my mouth could swoon then it just did… and I’ll be trying to figure out how to make black butter for the next month. 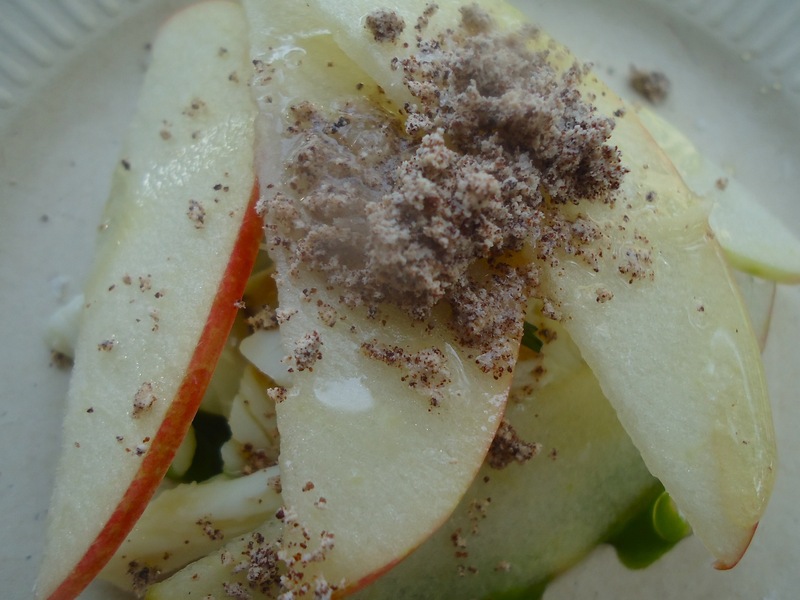 Chef Sean Brock’s FABULOUS apple “salad” with fresh lump crab, hazelnut oil, a trace of bright green tarragon puree and that unusual black butter. It was great. Once again the Music to Your Mouth Culinary Festival delivered the goods – in every way possible, I may add. If you’ve never been, its a unique and wonderful foodie experience like no other, and if you have, then lucky you! Either way, may the foodie Gods (and the fine folks at Palmetto Bluff) hold another fabulous MTYM in 2013. Count me all in! 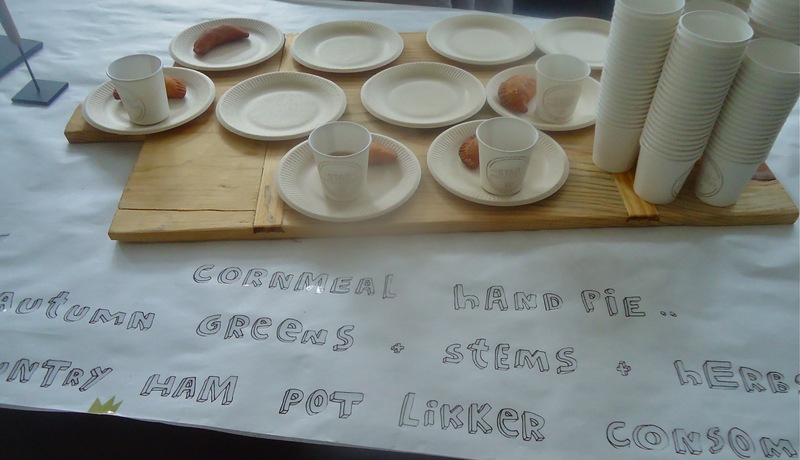 Bacchanalia (Atlanta) served a yummy hand pie with hot pot likker consomme – great on a cold day as it were. Some more table “art” too. Chef Anne Quatrano participated on the chef’s demonstration stage and was quite the card. It’s refreshing to know these “celebrity” chefs don’t take themselves or their “art” too seriously! 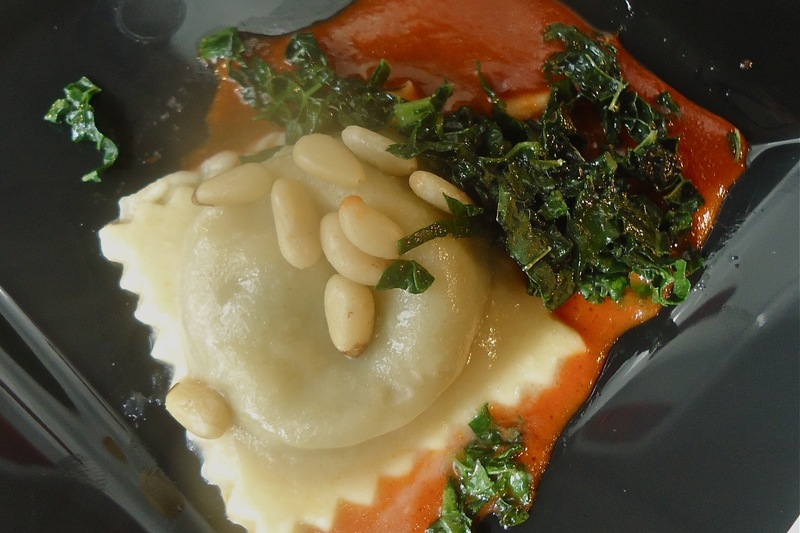 Jeremiah Bacon’s clam filled ravioli with pine nuts and kale. His restaurant, The McIntosh, is located down the road in Charleston, SC. The Sage Room (Hilton Head Island) and chef Matt Jording hit all the perfect notes with his duck dish – served with micro-greens and sesame ‘crispies’. All that great food and libations were accompanied by river front scenery and some live music fitting for the day. The columns you see are the remements of tabby ruins and some brick work from the original home on the property. The big tent at the Culinary Festival is perched adjacent to the May River and the Inn at Palmetto Bluff. Don’t be put off by the Orvis and Burberry clad “Garden & Gun” set. At this event you’ll find a veritable foodie paradise where you can actually meet some of the best chefs in the South. Ask questions too… they love that! 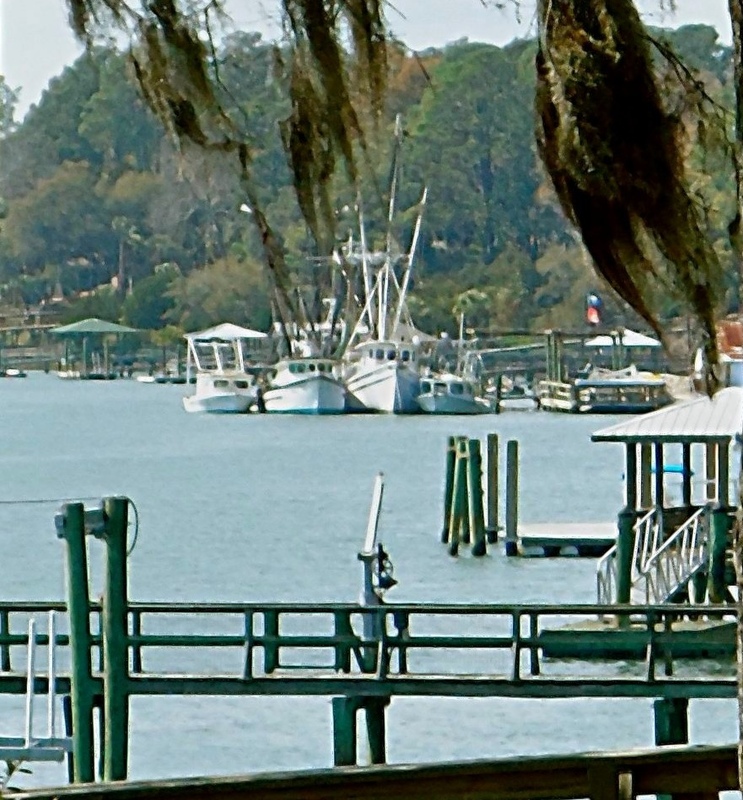 One of the small towns located close to where I reside, Beaufort, SC is Bluffton. Actually, Bluffton is not all that small as it ranks as the 5th largest ‘city’ in the state (by area), due to the incorporation of various annexations in the past dozen or so years. The largest of these was the property known as Palmetto Bluff, previously a hunting property, now a development replete with Jack Nicklaus golf course, a spectacular Auberge Resort, multi-million dollar homes and it’s own little “town”. These fine folks also hold homage to all things deliciously Southern at their annual Music to your Mouth Festival held in November. 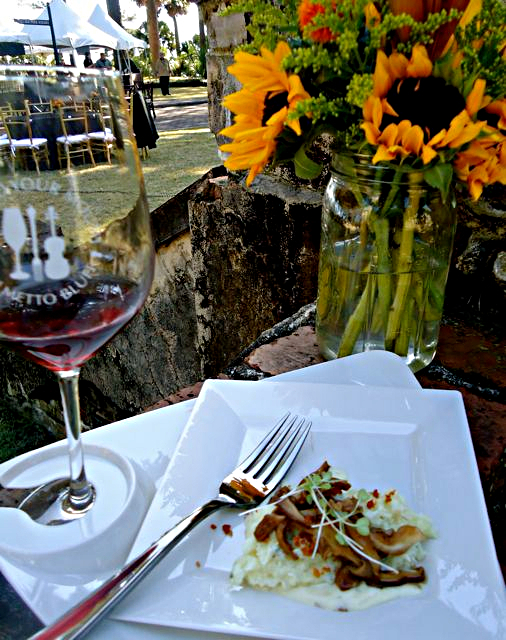 It’s a literal bacchanalia of food, wine and southern-inspired artisans showcasing their work. Of course, with the gorgeous setting overlooking the May River and sumptuous, tasty treats prepared by foodie celebrité chefs like Chris Hastings, Sean Brock, Craig Deihl, Steven Satterfield and Hugh Acheson one cannot go wrong just attending the Saturday Culinary Festival. 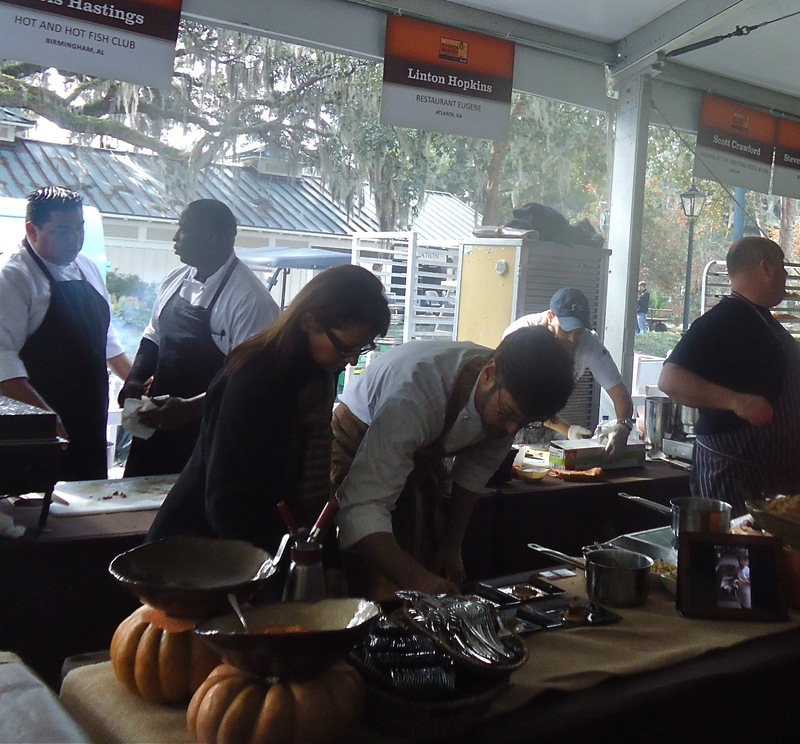 I was lucky to be invited last year and write about the Culinary Festival as part of my other blog, Hilton Head Island Foodie Vibe. Fingers-crossed, I will be invited back this November. Whether I am or not, it remains the finest example of mixing business and pleasure that I have encountered. There are actually a whole slew of events that make up the festival and one can surely carve a very nice foodie-centric getaway out of the week, if you are so inclined. Note that it is not a free affair – the cost is as they say, somewhat substantial, but where else can you actually strike up a conversation with that many accomplished chefs AND sample their best creations, all on the same day? This year I heard that there will be a bacon forest – are you kidding me? I must see (and nibble?) that! To say that Palmetto Bluff is a “nice property” is an understatement. To give you an idea, it has received the AAA-5 Diamond award for the last 3 years, U.S. News & World Report ranked it as the #1 hotel in the entire U.S. this year, and Conde Nast Traveler named it the #3 best southern golf resort and #15 spa this year. While that is all well and good, I find that the best aspect of this place is that it actually fits into Bluffton. This could be deemed peculiar since Blufftonians are known – and proud – to flaunt their ‘own state of mind’. 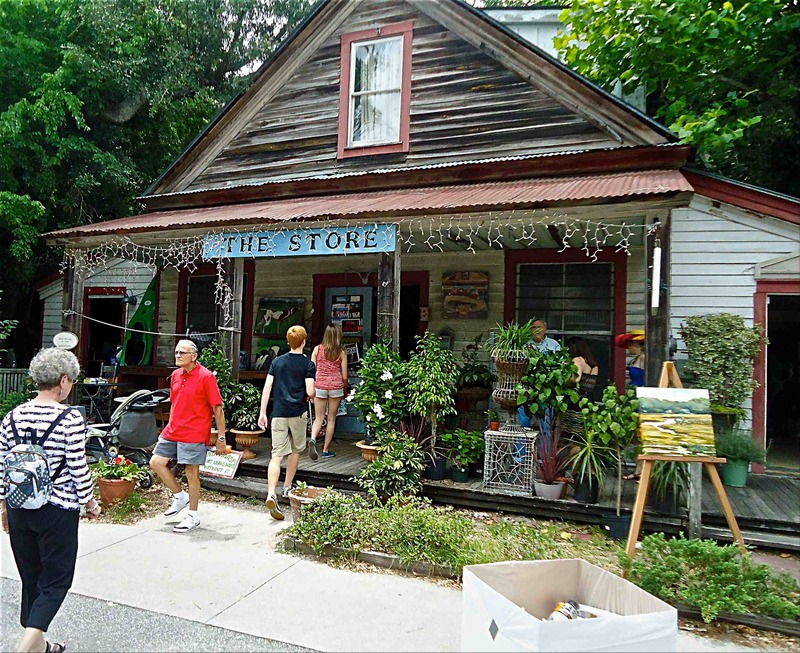 Old Town Bluffton itself, is well, old… and rustic with paint peeling, un-manicured yards and even neighborly roosters crowing at dawn… and other, usual times too. The flora and fauna here can be wild and well, quite beautiful in it’s own overgrown and verdant way. In Bluffton you can find a million-dollar home sitting contently next to a tiny, rusty tin-shingled cottage. When you belly up to the oyster table at the annual Rotary Oyster Roast don’t be surprised to find yourself standing between the CEO of the largest corporate business in the county and your car mechanic – both happily shucking and sucking down some briny May River beauties and discussing fishing for sea trout, college football and/or the stock market. No one really puts on any “airs” here – it’s that kind of town. Bluffton is one of my favorite places in the Lowcountry. I did live there for a few years and while it has transformed in ways there are still some things that have not changed in literally years (or even decades). I find comfort in this – the positive changes which equate to growth and, hopefully, prosperity – and reassurance that the beautiful aspects of the town, the May River and the quirky, friendly people of Bluffton will remain that way. Chef Matt Jording of the Sage Room on Hilton Head prepared this dish: Parmesan and Crab Rissoto Cake, Bacon Buerre Blanc, Truffled Shiitake at the Culinary Showcase held during Music to Your Mouth 2011. 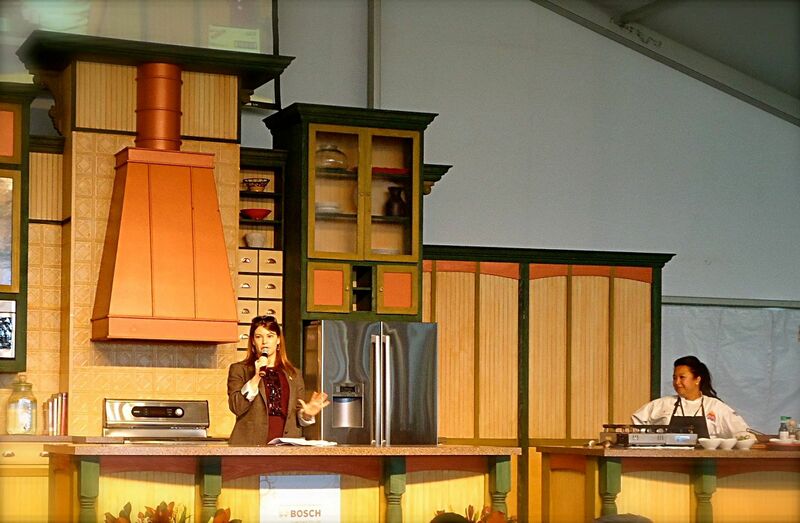 Gail Simmons of Food Network fame and local Chef and Food Network Star Contestant Orchid Paulmeier entertain the crowd up on the expansive demonstration stage at the Culinary Showcase. 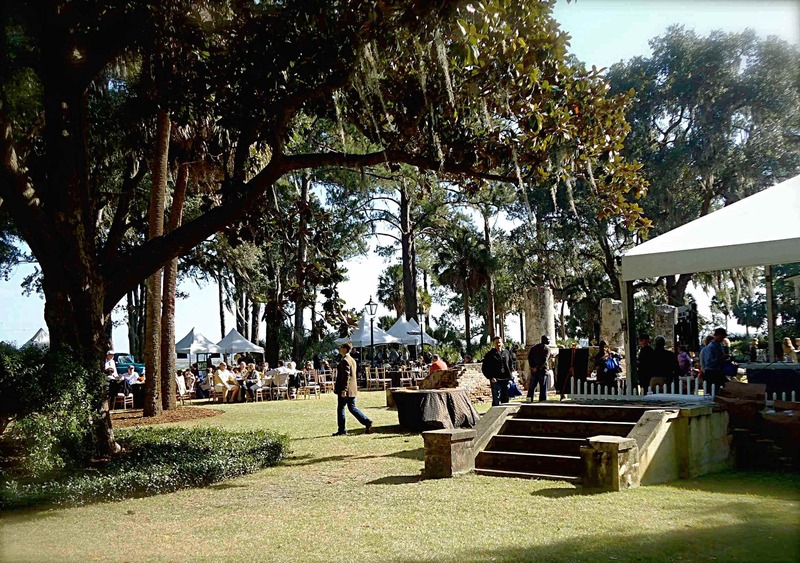 The Culinary Showcase tent and artisan promenade light up the green lawns of Palmetto Bluff (that’s the May River beyond the live oak trees). The Store is, well, a store that features vintage household items and real honest-to-goodness antiques. 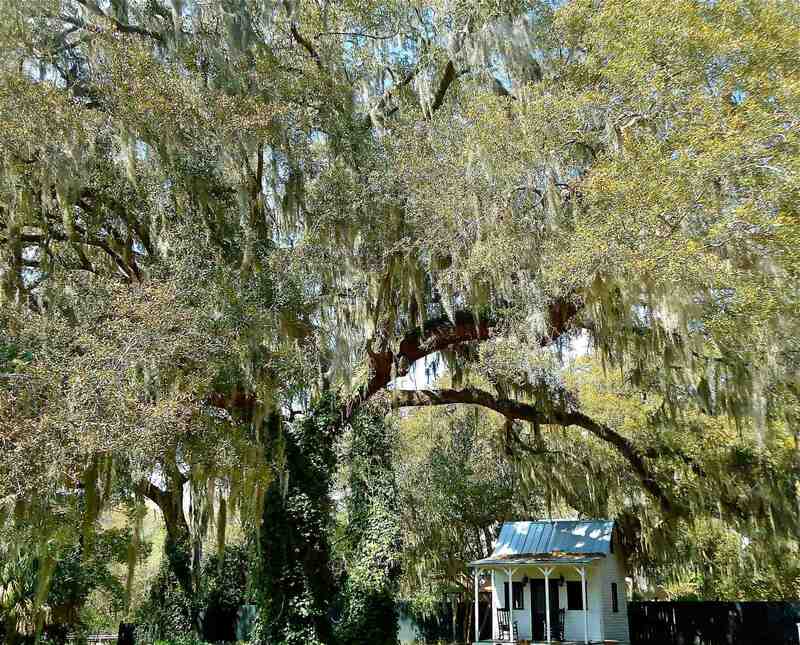 The centuries old building is in Old Town Bluffton on Calhoun Street. 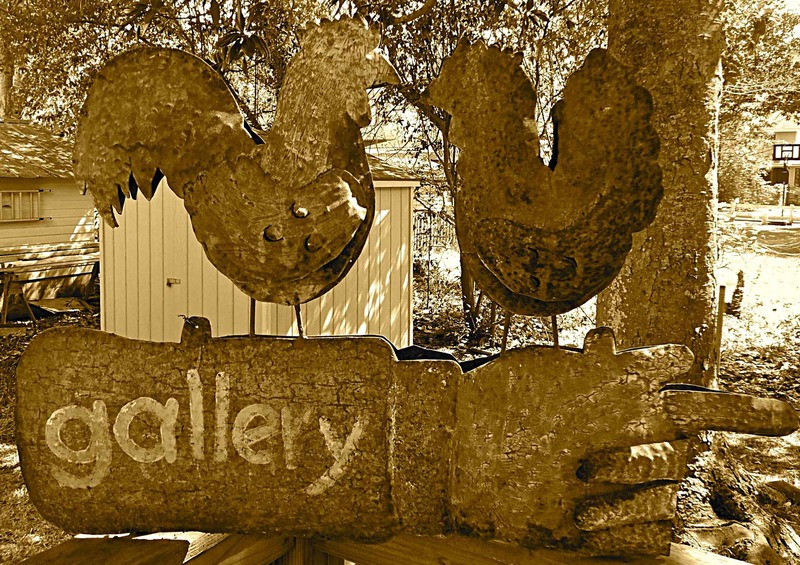 Bluffton is also an art-town with many working artist studios and galleries located in renovated cottages in Old Town. 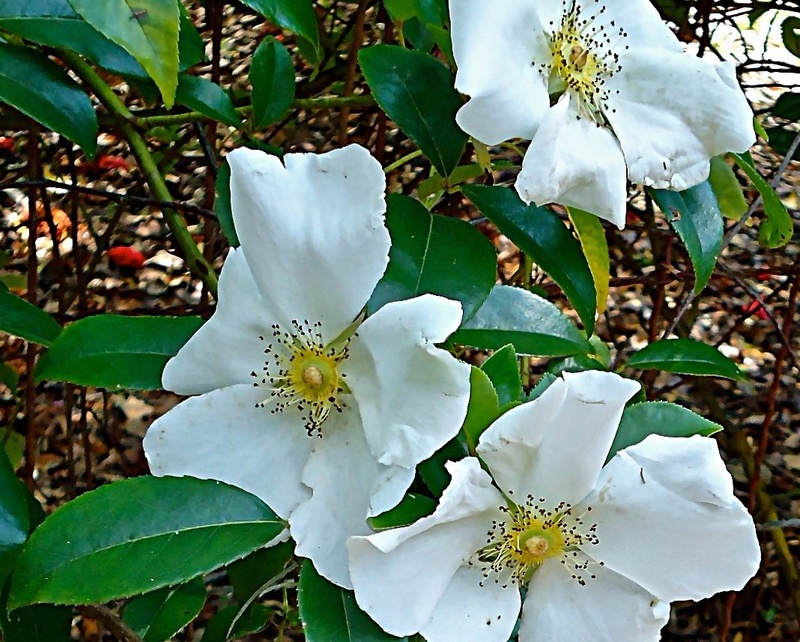 The May River and salt water estuaries (the marsh) are a place for play and work in Bluffton. Here are shrimp and fishing boat moored to a dock on the May. Also of note are the “pocket parks” the town is creating in the historic Old Town. Open to all, some have awesome views like this one. 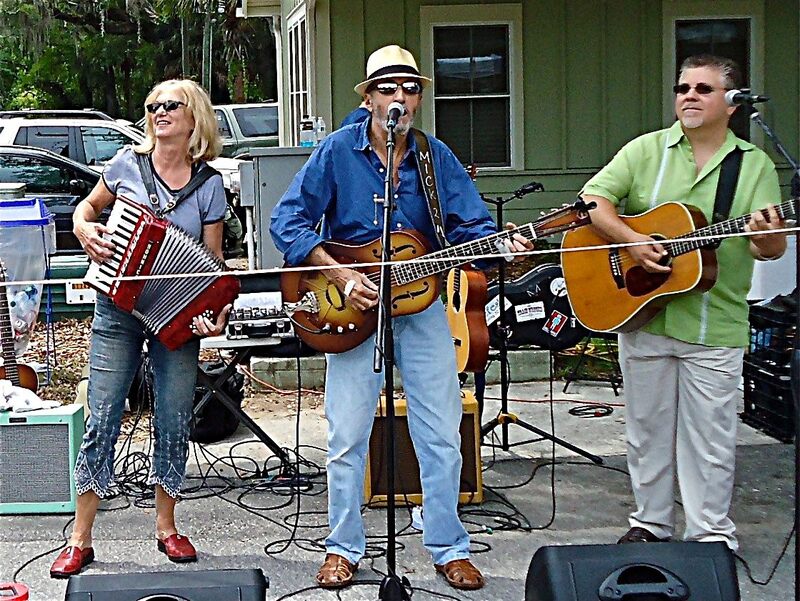 There are several festivals in the Bluffton area (including Music to Your Mouth). The Bluffton Village Festival is in May, the Art & Seafood Festival in October and the totally unique Christmas Parade in December. 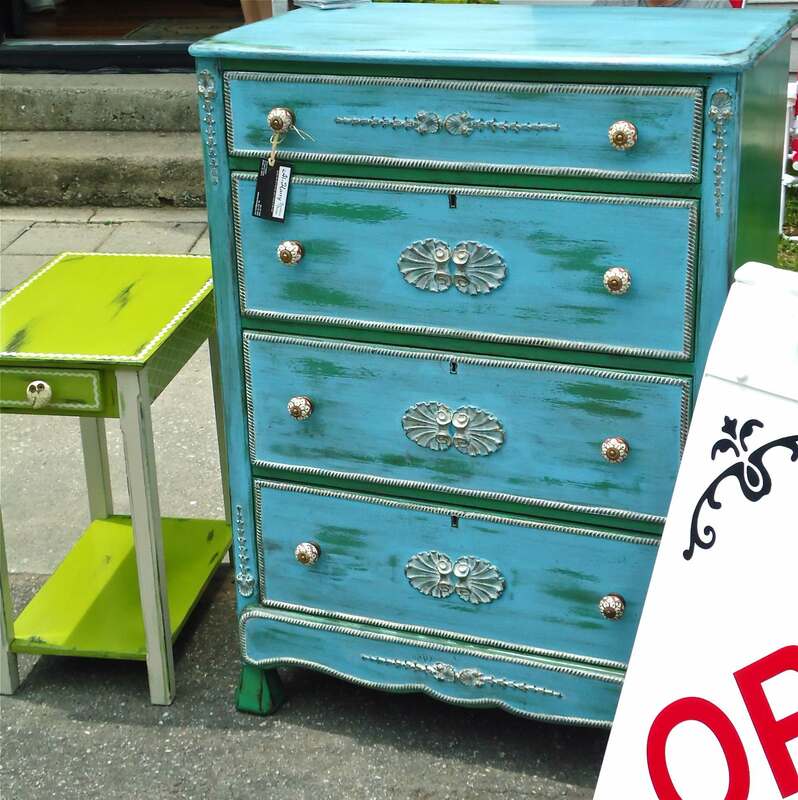 Many merchants (including artists) offer their wares for sale – like this pretty painted furniture. Live music is almost always on tap for Bluffton festivals . Check out the accordion! There was also a band member playing the wash board but he stepped out of the picture. Even the weekly Bluffton farmers market features live music. A pretty clematis vine grows among the azalea bushes and honeysuckle at the pocket park. 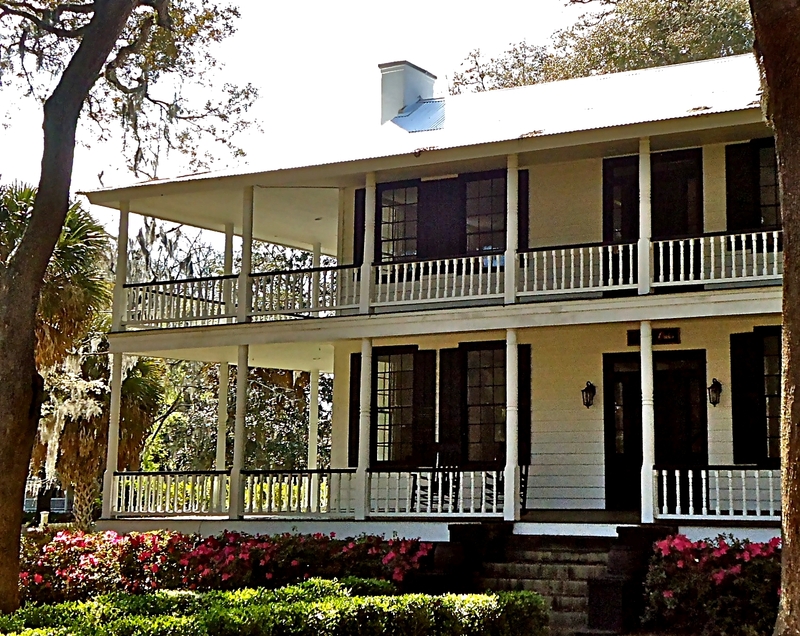 Seven Oaks was constructed in 1850 and has been carefully restored in a manner typical of antebellum homes. It’s located near the end of Calhoun Street, close to the Church of the Cross and May River.